Our 35-acre Deer Ridge Resort on Garden Lake in Ely, MN specializes in family-oriented vacations and exceptional outdoor fun. We have over 2,500 feet of beautiful shoreline with a swimming area and docks along one of four lakes in the White Iron Chain of Lakes. 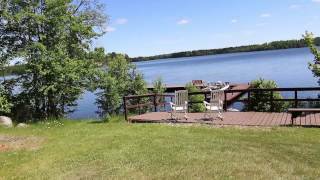 From Cabin 7 at Deer Ridge Resort you have lots of pristine water to fish, swim, and explore as Garden, Farm, and White Iron lakes allow motorized boats. We also have free canoes, kayaks and paddle boats for guest to use if you prefer people-powered water sports. The 2-bedroom/1-bath lakeview log cabin has an extra-large deck with picnic table, lawn chairs, and a charcoal grill for all your outdoor dining/relaxation. Free WiFI is included. The interior wood panelling in this A-frame cottage creates that infamous Minnesota Northwoods rustic ambiance. The open concept living/dining/kitchen area provides a nice roomy area to relax and prepare meals. The cabin’s fully equipped kitchen has a refrigerator, stove, microwave, coffee-maker, toaster, dishware, cookware, silverware, and cooking utensils. An eat-in kitchen dining room table seats six. We have a laundry facility on the resort for guest use. Please bring your own kitchen and bath towels. Dogs are welcome family members, but please keep them on a leash or controllable by voice command at all times and remember to properly dispose of pet waste. Sleeping arrangements: Bedroom 1 (main) - queen bed; Bedroom 2 (upper) - full bed. Our Deer Ridge Resort is located in The Superior National Forest and has its own hiking trails. Fishing is the most popular activity at the resort, but we also have an interpretive nature trail, playground, frisbee golf, swim area, horseshoe court, canoes, kayaks, paddle boats, and convenient fish cleaning station. Over 6,000 acres of some of the best world class fishing awaits you on the White Iron Chain of Lakes. Garden Lake’s 670 acres are famous for excellent small mouth bass, crappie and northern pike catches. You can also access 618-acre South Farm Lake in the Boundary Waters Canoe Area. This is one of the few lakes in this special wilderness canoeing area that allows motorized watercraft - 25 hp or less. We can help you get a permit, but please contact us in advance as these permits are limited. There are plenty of things to do right at the resort - fishing, canoeing, kayaking, paddle boating, swimming, frisbee golfing, board games, nature photography, bird watching, star gazing, and just relaxing on the spacious deck of your cabin. You can also walk to the majestic Kawishiwi Waterfalls. The 1.5-mile trail has a minimal elevational climb through the forest, some areas along a boardwalk, and has several vantage points to see the falls. Take a short drive into Ely to shop, dine, and visit the International Wolf Center, Bear Center, and Dorothy Molter Museum. The museum preserves and interprets Dorothy Molter’s Northwoods wilderness life on Knife Lake and her famous root beer recipe. She is fondly remembered as the last non-indigenous resident of the Boundary Waters Canoe Area Wilderness (BWCAW). Inquire about our fishing packages.